Home » SeoTips » How to Submit Site to Bing / Yahoo!? You have two options for submitting your site to Bing Search Engine. Anonymous Site submission - You will just submit your site and will not know any further information. Using Bing Webmaster Tools – You will know the crawling errors and have many other options to optimize your site for Bing Search Engine. Both Yahoo and Bing Search use a common Bing search engine; hence you can pull traffic from Yahoo and Bing by submitting your site to Bing Search Engine. Bing and Yahoo! together hold over 30% of the search engine market share in English speaking countries. Bing also has partnered with Baidu, the famous search engine in China, for displaying English search results. You can also submit your site to Bing as anonymous without registering for Webmaster Tools account. The only difference is you may not be able to avail other free services from Bing if you choose this option. Click here to submit your site to Bing. Once submitted you will be shown a message for successful submission and offered to sign in for Bing WMT account. You need to sign up for Bing Webmaster Tools or you can use your Windows Live ID if you already have one Signup here. 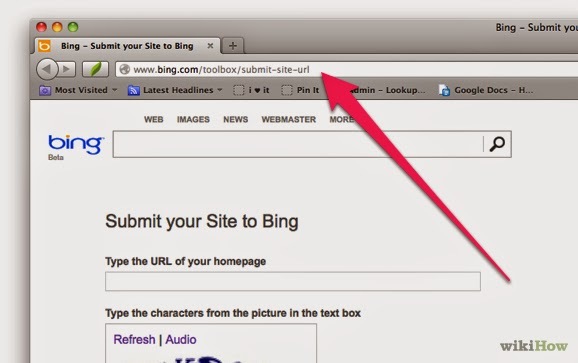 After logged inside Webmaster Tools, you can use "Add a Site" link to submit your site to Bing. Once you add your site then you need to verify the ownership of your site. Bing offers three methods to verify your site. As an easy method, you can choose the second one, copy and paste the code in meta tag of your home page. It may take a few days for Bing to crawl and index your site in the database. Bing also offers various other features like SEO Reports, SEO Analyzer, Markup Validator, Site Activities and Sitemap submission. Learn More about Bing Webmaster Tools here. Thanks for sharing this tip's for submissions..in Bing. It really helps to user, who want to submit their website to Bing/yahoo. But I am facing some tools are not working in my case, such as -Mobile friendly test, Back link reports, Crawl errors. Hope these problem will be addressed by "Support"
isbcomputer.com is a dedicated online store offers Printer Spare Parts, Formatter Card, Main Board, Power Supply Board, Flat Cables, Fuser Pressure Roller, Gear, Sensor, Scanner Units, HDD Parts, HDD PCB, Hard Disc Drive Spare Parts, Data Recovery, Refilling Products, Jet Image, Toner Powder, Toner Drum, Toner Cartridges, Laptop Accessories, Power Adapters, Computer Accessories, Computer Services, Computer Peripherals and many more Computer and Printer related products at one place with best prices.